More than two months after the incident, and despite repeated appeals from the US and EU states to release them, 24 Ukrainian sailors are still being detained by the Russian authorities, after Russian Navy ships rammed and fired on three Ukrainian vessels that Moscow said were "maneuvering dangerously" near the Kerch Strait. The Russian Coast Guard captured some two dozen sailors after commandeering the ships, which included to Ukrainian artillery ships and a tugboat. Russia has refused to release the ships and the sailors despite demands from European and US officials. The latest move to counter what has been described in western capitals as "a persistent campaign of malign behavior by Russia", would be jointly applied by the US and the EU. The new measures will be discussed at a meeting of EU foreign ministers next Monday according to the FT, and could be levied in the next two months, according to diplomats briefed on the discussions. 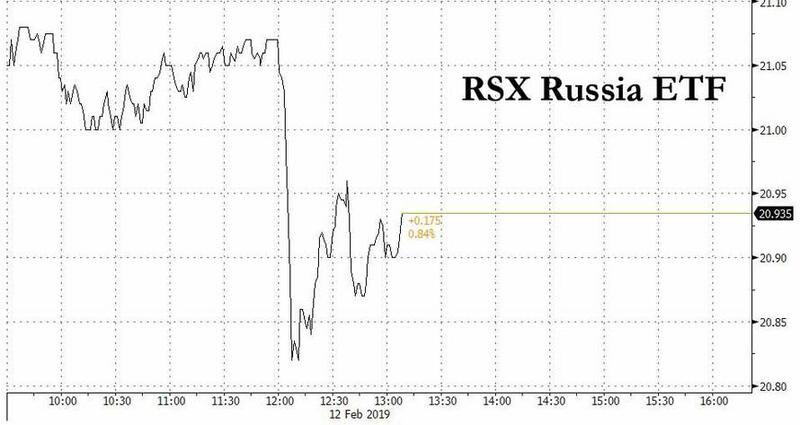 News of the latest sanctions hit Russian ETFs such as the RSX, while the USDRUB spiked to session highs, jumping from 65.55 yo 66.20 before retracing some gains.